India Adventures- What India Taught me About Healing Blog #2 – Dr Alexina Mehta, N.D. Standing outside the airport, we waited for our coach bus to arrive and take us to our first destination. The ride was smooth for the most part and I marveled at how I felt in my body. One of the tools I often guide patients to work with is simply noticing how the body feels. I was exhilerated to say the least. Looking around and seeing evidence of sanskrit writing on the walls of warehouses, myriads of cows roaming the streets, people selling their wares at the side of the street, huge buildings painted bright orange, yellow and green…India was ALIVE. Pulsating with mantras, statues of Ganesh and Lakshmi where ever I turned to look and smells of all kinds. Transparency at it’s finest- so refreshing. Our driver seemed to misinterpret the directions and spent a good extra half hour trying to figure out where Goa’s best kept secret was. After a day and a half of travel, we were all ready to get some sleep. I was somewhat amused by the driver’s sincerity in trying to figure out where to drop us off. Finally we headed in the right direction and arrived in the pitch black of the night at The Rivercat, a Goan Palace nestled at Mandrem Beach. The owner, Reno and his assistant greeted us with a warm Indian welcome. We settled in and many of us stayed up to watch the sunrise. It was a strange feeling to be exhausted and exhilerated at the same time. 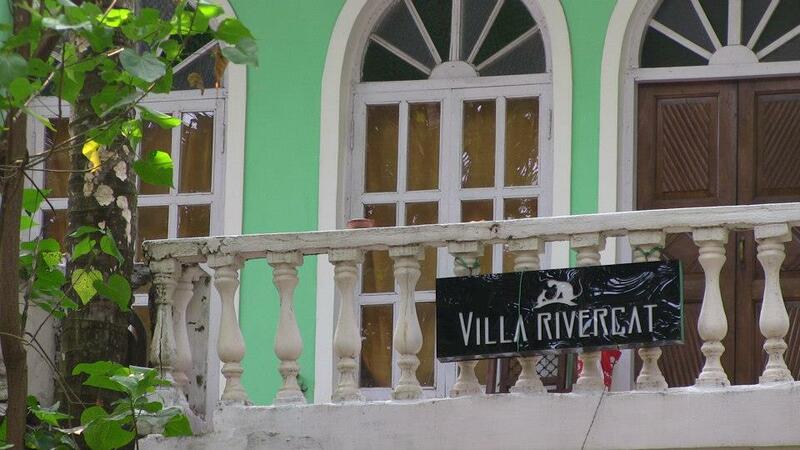 Rivercat was on a river and also many cats lived there…pretty literal name. It was a nice touch, especially for cat lovers. Our time in Goa was rejuvenating. Some say it’s very different then the rest of India. In my opinion, it left an impression of bright, friendly and rejuvenating. Mandrem beach was pristine. I will never forget it. On our first few days there the depth of the land was showing itself to me. India, the oldest preserved ancient culture still operating. And now for our purpose of traveling so far. Heading to Mundgod, a Tibetan Colony in the province of Karnataka was the next adventure. A subtle sense of strength overcame me as we prepared our bags and headed back on the bus. I knew I was headed on some kind of quest for the truth. An open mind, curious disposition and soaring heart was what I brought with me. I was totally ready to meet the eyes of truth and excited to settle into the depth of myself that knew exactly what I was getting myself into. The drive from Goa to Mundgod was bumpy as one might expect…but when we finally arrived, we were welcomed by the sight of monks in burgundy robes walking the streets in devotion. It was stunning. 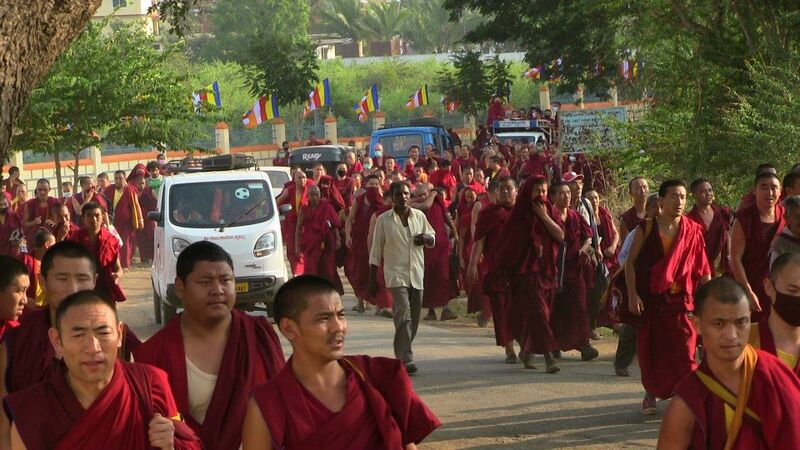 More monks, seas of monks who came from all over to attend the teachings by His Holiness, the 14th Dalai Lama. What an incredible sight. So many souls coming together in the name of Enlightenment for all sentient beings. I feeling of exhilaration and peace overcame me when I realized the significance of what we were going to embark upon in the next several days. Well the next day was a potent one..and things went in a direction we were not expecting…stay tuned to find out how our trip took a royal detour! 1.When we travel it seems easier for some reason to move into the flow. See if you can find your flow in life in the day to day. Does life seem to be the same for you? If everything looks the same, you are not in the present moment. 1. What makes you feel ALIVE? 2. How can you bring more light in to your life? I’d love to hear your thoughts, so please enlighten us all with your experiences below and share this blog to spread the love!